Dennis (Denny) McGurer, the founder and president of McGurer & Associates, is our “head coach.” If you take a moment to read through his associate profile, you’ll see that there is much to be learned from his many successes. In addition to his personal experiences, Denny’s personality and style allow him to move gracefully between tenacious assertiveness and generous humble servant leadership. 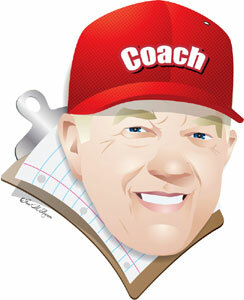 The Coach’s Corner is his opportunity to bring you insights from both ends of this continuum. Visit us periodically for informative, practical, thought-provoking articles and essays fanatically dedicated to ideas on the leading edge of human capital development—all penned with care by The Coach. In this virtual panel discussion format, two different companies have agreed to talk to us about how to best use leadership coaching in your organization. Warren Kurzroc is the CEO of Porter Henry & Co., Inc., a 60 year old organization specializing in all phases of salesforce development, including training. He has held many sales management and leadership positions and developed Porter Henry’s leading-edge Sales Leadership, Sales Coaching, and Managing Sales Performance programs. Denny McGurer has over 30 years of sales, Sales Management and Coaching experience throughout the world. He has lead and managed 1100 people in three global corporations. Most recently he has conducted coaching partnerships and team chartering in the chemical, pharmaceutical, construction and printing industries. How do companies use one on one coaching for their sales managers? Porter Henry: Generally for newly-promoted people, although it can be for someone who is performing well but has a gap in one particular area such as “too demanding”, or needs help in overcoming a gap such as “organizing the sales team” or “recruiting”. Quite often coaching is used as a follow up to training, particularly at District or Region levels. McGurer: Two Options: First - Internal mentor who must be committed / skilled at the coaching process and have the support of senior management for the coaching initiative. Second – An outside resource who has coaching experience and knows the respective industry. In both cases the “how” needs to be addressed by proper assessment of the competency gaps and related development plans put in place after which growth / results can be measured. What audience is this primarily used for? Porter Henry: High potential, new to position or industry, veteran with some developmental needs. McGurer: Worked primarily with high potential individuals who currently have major sales responsibility in the organization or will be moving into new responsibility outside of the sales function. What level do you usually start working with, VP, Regional SM, District etc.? McGurer: Focus on Director / Vice President with the total support of the CEO whenever possible. What are most common topics you coach on? Tips for making the news palatable for the manager? Porter Henry: Make it positive and clear that company would not bring in outside help unless they realized his/her potential and ability to have greater success. McGurer: Develop “Trust” from the start of partnership and “always” have your counsel supported by the appropriate behavior. Any advantages to using an outsider for these messages? Porter Henry: Objectivity plus professional advice. McGurer: An outside coach brings a breadth and depth of current marketplace thinking that usually is not available internally. Objectivity is at the core of a professional external coach’s value. What qualifications should we look for in choosing an outside resource for this? Porter Henry: Experience and knowledge of what makes people and salesforce work effectively. McGurer: Results – contact previous clients, at least three, for appropriate input. Make sure the coach has a defined process for developing a growth plan for their client. Also, a coach who is comfortable dealing with “C-Suite” is an added value. What final thoughts would you leave us with on this topic? McGurer: A coach needs to find the “Sweet Spot of Success” for their respective client by assessing and analyzing their strengths and interests and company needs.